As much as I love a clean and organized living room that I can relax in, I also understand that attempting to keep it that way all the time is not realistic or healthy for anyone's well-being. We shouldn't feel like we live in a showhouse! I want my family to feel comfortable in their home; the kids AS WELL as the adults. That means that I want my kids to be free to use our living room to work/play but have a plan to put their belongings away once they were done; allowing me to relax and enjoy my living room once in a while too! SO I came up with an organization plan that is easy enough for parents to implement, and kids to partake in. -SHOES, TOYS, SCHOOL PAPERS, ART & ART SUPPLIES, and ELECTRONICS. To take control of this situation, I implemented 5 organization tricks that have worked WONDERS! And I'm sharing them with you now! Here they are! #1 TIP: Set a large basket (with handles, if possible) next to your home's main entrance or by the stairs. As soon as the shoes come off, they go directly in the basket! No more shoes all over the place! 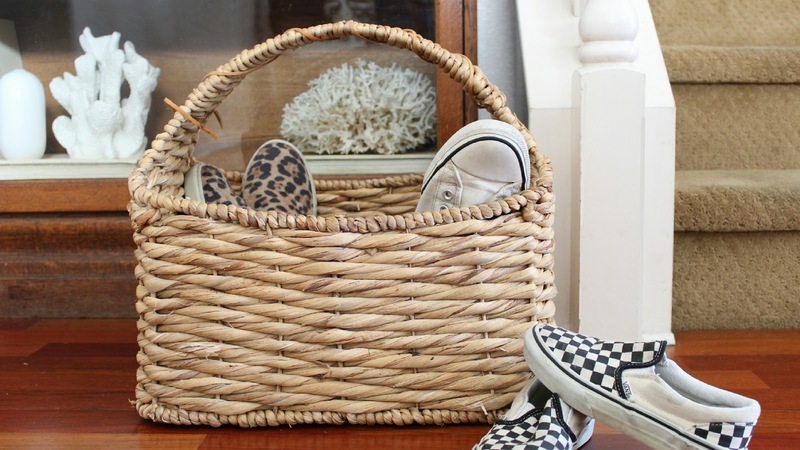 Pro-tip: Use a basket with handles so at the end of the day, you can carry the basket upstairs, shoes and all! PROBLEM: Toys are not being put away and end up being left downstairs. #2 TIP: Use a good-looking hamper with a lid that coordinates with your living room decor to house toys. No colorful or obnoxious toy boxes needed! Having a place downstairs to store toys allows for quick clean-up. No one has to haul toys back upstairs to their rooms! P.S. If you have a need for a good looking hamper or basket for storage then check out my post HERE. PROBLEM: There are tablets and phones all over the coffee table! 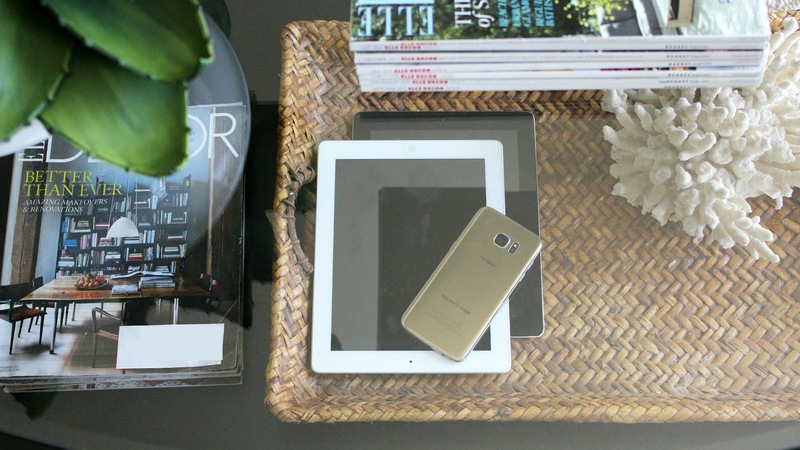 #3 TIP: Use a nice tray to corral all those electronic devices on the coffee table. PROBLEM: My kids come home with tons of art and papers from school and I have a hard time keeping up with it all! #4 TIP: (This is a good one.) Designate and label a drawer for each child in your home. It can be a drawer in your kitchen, media console, sideboard, anywhere near your main living area. I use my sideboard in my dining area. Inside that drawer, your child has two piles of paper. One clipped pile of important papers like homework and school papers; and a binder of artwork they want to keep! This artwork binder is labeled with the child's name and the current year. These art binders can be kept and filed for many years, with all of that year's art protected and displayed like a book. Each of my kids have their own drawer. They love this! all school papers are clipped together! Found these clip binders at Target for less than $2.00. I use them to store art. One for each kid, and one for each year. I can archive these "books" for many years in a cabinet and best thing is, they won't get damaged! Problem: My kids can never find a pencil, eraser or tape and their crayons are all over the place! 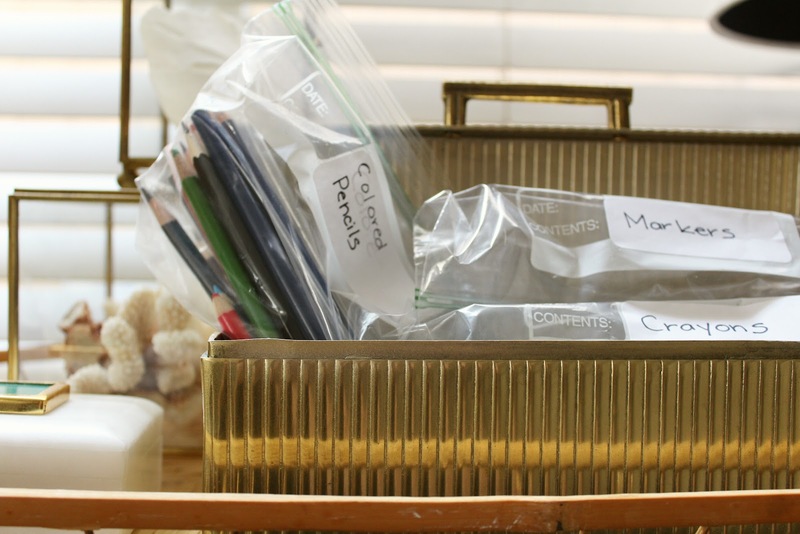 #5 TIP: Use clear storage bags to bundle markers, crayons and pencils together and place them in a nice box! 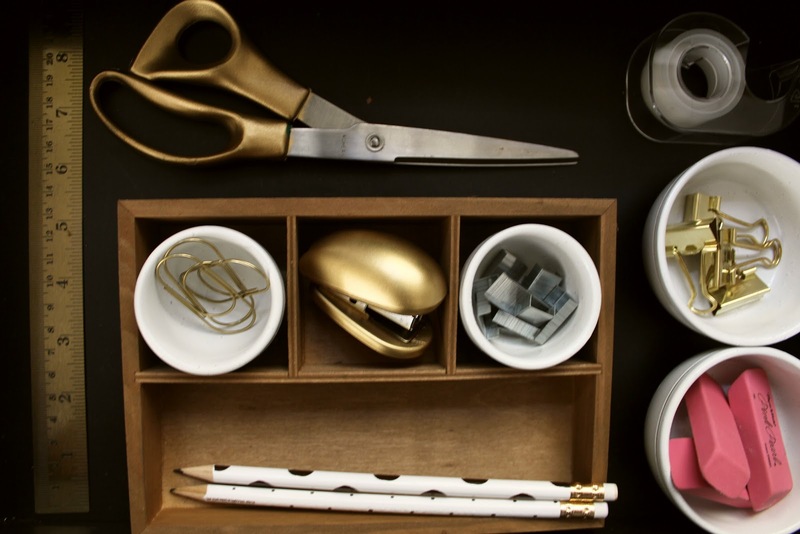 Designate an area like a shelf or drawer for art supplies and stationary only. storage doesn't have to look "baby-ish"! It surprised me to see how excited my kids where when they found their crayons and pencils organized and labeled. They LOVED IT! My messy kids seem to respond very well to order and organization. I think it helps them feel a sense of control, actually. I'm pretty proud of how I organized our supply drawer. It's the only drawer in my house that looks like this, but still, I love it! I love using little sake cups for storage. I found them at a local Japanese store called Daiso Japan here in San Diego. These little sake cups were $1.50 each! I also love how all my supplies match. It's not a lot of extra work or expensive to take things one step further and find aesthetically pleasing supplies, and it gives me so much joy when I open up the drawer and see it looking so nice! I even spray- painted my existing scissors and stapler gold so that it can match! Hey, I found a beautiful gold stapler and scissors at a major department store for over 17 bucks each! I couldn't do it when I knew I already had scissors and a stapler (and gold spray paint) at home! So there you have it! 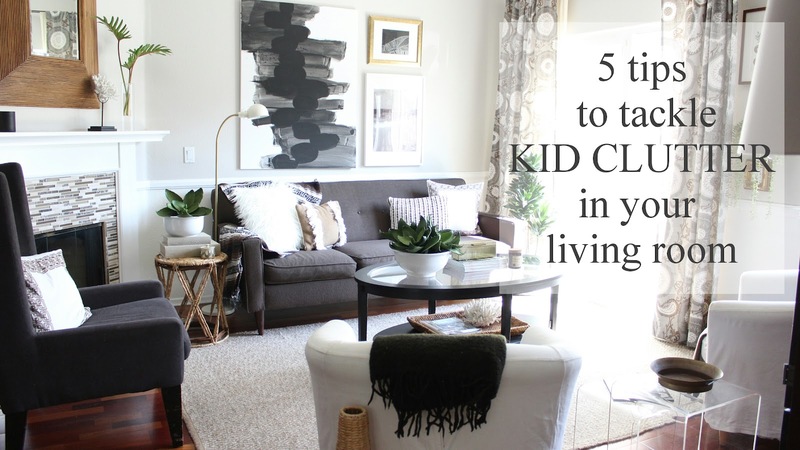 5 tips you can easily incorporate in your home right now that will help you organize your kids' stuff and allow you to enjoy your living room. Here is a cheat-sheet rounding up my 5 tips for you to pin in case you need to reference it later! I hope you find these tips easy to incorporate in your home. I tell you, us parents deserve to rest in our own living rooms without tripping over shoes or sitting on toys! Let me know what you think about these tips in the comments, or feel free to ask any questions! Awesome article!!! These things are so easy yet so helpful! Very good collection of tips for handling kids clutter. My son is always creating mess in our home. your tips are very helpful for us.